Detailing the physical features, habits, territorial reach and other identifying qualities of the Oleander Aphids. The rapid breeding and fast development of the tiny Oleander Aphid contributes to its status as a huge pest on ornamental flowers. 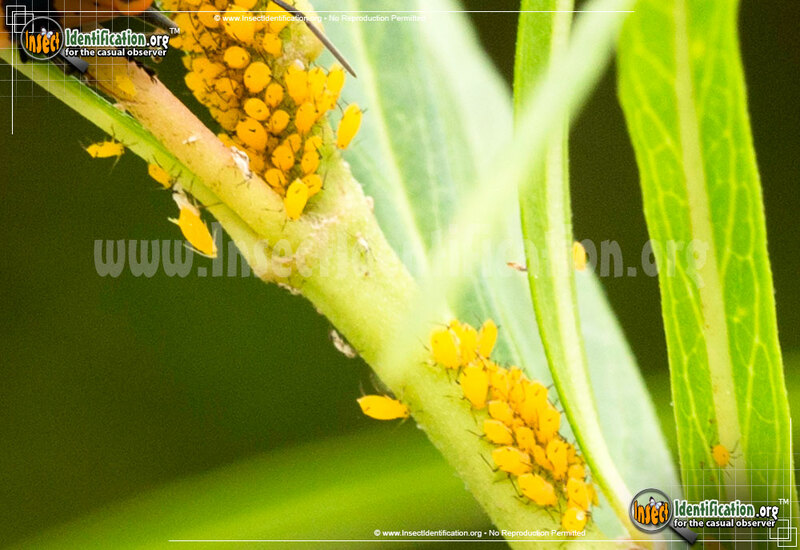 The first sighting of a yellow-orange cluster of Oleander Aphids should put a gardener on the defensive. They feed on the plant juices of oleander, milkweed, butterfly weed, and wax plants - all popular plants in homes and butterfly gardens. Quick to reproduce during their short lives, Oleander Aphids need little time to infest a plant. Oleanders are a popular ornamental flowering plant in southeastern states like Florida. Plant nurseries can lose product and profit because of an infestation. The aphid's presence ruins the beauty of the oleander because it creates a sticky 'honeydew' on the stems, which can eventually turn black with mold. Oleander Aphids use their mouthparts to poke into the plant stem and then siphon plant juices, damaging the plant's overall health. The ends of branches can deform and and wilt as a result of this constant feeding. Other plants near infested ones are also at risk because the aphids can spread a plant virus, further impacting nurseries or gardens. Natural predators of the Oleander Aphid include certain kinds of parasitic wasps, Lady Beetles, Lacewings, and Hoverflies. Insecticide use to control aphid infestations is effective, but care must be taken in choosing one that will not also harm beneficial insects needed to pollinate flowers.